This pattern is designed for a man (or woman!) with a larger calf muscle in their legs. If you are knitting this for a leg larger than 17″ diameter, you can add stitches to the leg cuff using the gauge as a guide as to how many to add. Then simply decrease the stitches down as you get to the ankle. 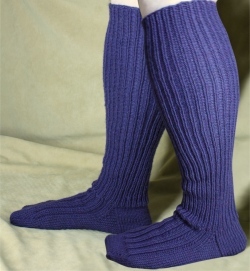 Notes from my husband, the guinea pig model for the pattern *grin*: He said the sock is very comfortable and very cushioned, which is something he prefers in his socks. 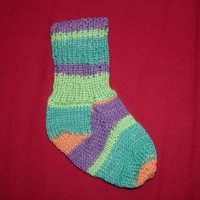 However, I made it with a wool yarn and this made the sock VERY warm. If you live in a warmer climate, we recommend using a cotton blend yarn or something that won’t retain heat quite so efficiently. If you live in a cold climate, wool is probably perfect. 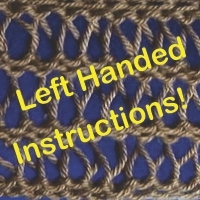 1″ = 5 stitches and 6 rows in Stockinette stitch. The remaining sts will be worked into the heel. K 22 rows in St st.
*Repeat the last two rows until all the heel sts have been worked. You should have 12 sts remaining. Put the sts from the stitch holder back onto the needles. These are the instep sts. On the RS, k the heel sts you’ve been working with. Pick up 14 sts along the other side of the heel. You’ll have a few sts left on the original needle from the heel. k half of them onto the same needle as the 14 sts you just picked up. This is Needle 3. Continue to alternate the last 2 rounds until you’re back to 56 sts. Continue alternating the decrease and even rounds until you’re down to 28 sts. 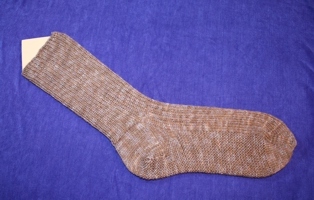 Finish off with your preferred method – I used a kitchener stitch in the pictured sock.